Pentax made the meter, but Honeywell was their official importer, so in the USA, their products meters were cobranded at the time. The name comes from its performance: it measures a 3° area inside 21° field of view. Like the SEI Photometer, it's telescopic, but the SEI uses an internal light bulb to compare against the surrounding field; this Pentax measures the reflected light of that little spot. This is one of the earliest of the new wave of CdS meters that took over the market in the early 1960s, along with the Gossen Lunasix and the Sekonic Microlite. Those three meters also showed the world of the metering future, at least until digital took over. The Microlite was the simple one, the Lunasix was the professional "system" meter with various attachments, and this was the affordable spot meter. This is the earliest version, which looks upside down. You hold the box in the palm of your and and look down on that black stove-pipe. There's a 45° beamsplitting mirror inside, and you get part of the light and the meter gets the rest. Later versions would be further restricted to a 1° area, and changed to a more comfortable pistol-grip design. One of the oddest things about this is that takes two different batteries: the standard 1.35v mercury battery that you can no longer find, and a 22.5v Eveready 412 which, strangely enough, is still available. This is still quite a nice machine, if you can get the batteries sorted out. The little button battery runs the high-light-level system, since you don't really need much juice for that. The big one kicks in for the low-light circuit. The lens on the front is a 100mm f/2.5, which gathers a lot of light, and the meter scale is big and easy to see. I wear glasses and some of these eyepiece designs don't work very well, but this one is a joy. The calculator scales on the lens make sense—you don't really need to read the instructions to figure it out. The front lens is threaded for 46mm filters so you can measure directly through the filter. And there are lugs on the side for a neck or hand strap if you're so inclined. It's also suprisingly light, considering it's size. Got mine the way I acquire most of my high-end stuff: broken. Sometimes I'm actually thankful that people let their batteries leak and ruin the battery chambers of cameras and accessories; I get a lot of bargain equipment that way. This meter bears a strong familial resemblance to my Mekano Spotron Pro. I don't know if they were truly made by the same people, but I believe so. There's an interesting webpage about this meter at Dave Schneller Photography. Manufacturer's specifications: Heiland Pentax 3/21 Exposure Meter. Features: ASA indexes 3-6400, apertures f/1 to f/45, speeds 4 sec. to 1 /4000, dual range with meter needle indicator visible through reflex viewing finder; power supplied by two 1.3-volt mercury cells, one 22.5-volt dry battery. Price: $79.50. Importer: Heiland Division, Minneapolis-Honeywell, 5200 E. Evans Ave., Denver 22, Colo. Exposure meters up to a few years ago were like many pet dogs—they love everything and have no discrimination. Their selenium cells take in a vast angle of view, often far larger than that of the camera lens, and produce an average exposure reading. For more critical work, you move in for a close-up reading of the subject. If this isn't feasible, you might find a substitute subject for purposes of exposure calculating. These meters have no finders. You point them in the direction of the subject and hope your aim is adequate. A football player on a field, a stage actor, a skier in the middle of bright snow are imponderables requiring a meter, crossed fingers and luck. Enthusiasts for long lenses find it virtually impossible to get a proper reading for a narrow angle of view. A few difficult-to-use meters have existed which remedied the situation partly or at great expense. The battery-powered cadmium sulfide cell meters, however, are solving the problem and the 3/21 goes further than any other CdS meter yet available. 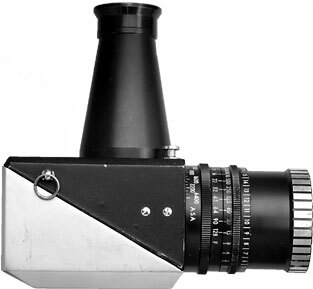 It resembles and is the size of a small waist-level single-lens reflex camera. 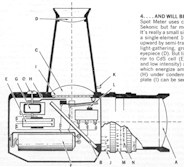 It has a single-element 100mm lens and no diaphragm. 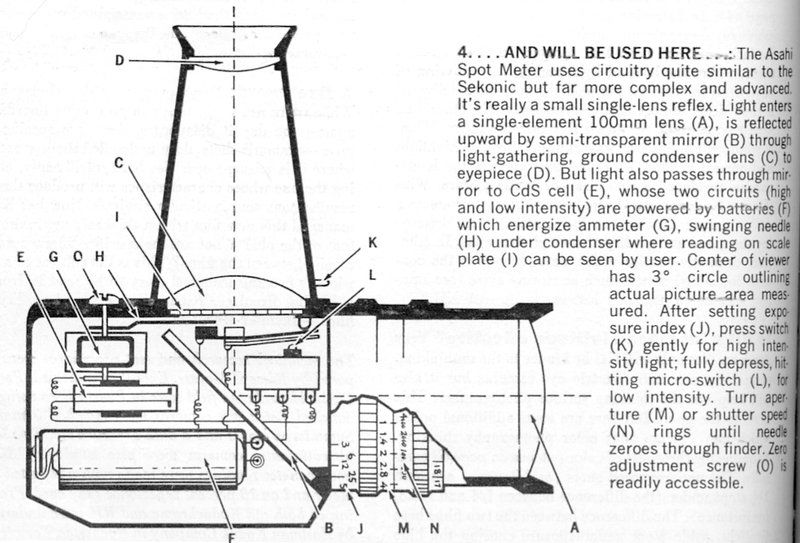 On the ground glass, viewed through a conical magnifying hood, you can see a 22° field of view with a small circle marking the 3° covering area. At the bottom of the viewing area a meter needle and a double scale with both high and low light markings are visible. Locate the important subject material within the interior circle and press the shutter—excuse me, the exposure meter release button. If there's insufficient light, and the needle doesn't swing over appreciably, press the release further. The low-light circuit then goes into operation and you read the needle setting from the low-light scale. The result will be a number from 3 to 18 (the meter calls this an EV number but it isn't). By setting the ASA index and this number on the circular scales around the lens mount you can line up all the possible lens-opening/shutter-speed combinations. In use we found that the meter could give us an accurate reading of a distant subject speedily, that it was sensitive and quite discriminating— almost too much so, since a tiny shift in aim would change the reading drastically. In addition the meter must be used with caution if a particularly bright area falls just outside the 3° covering area. In such cases the bright area does inflate the reading. Viewing the scene and scale on the ground glass will require some practice. The non-focusing lens seems to be set at about 6 ft. At near or farther distances it is somewhat difficult to focus your eye on the subject and scale simultaneously. There's a convenient slotted screw head to allow zeroing but no battery check. The batteries should be replaced at least each six months to play it safe. The meter can read a low-light exposure of 1/8 sec. at f/2 with a film having an exposure index of 400. In low light the calculator rings with their between-number markings may be somewhat difficult to see if your eyesight is less than good. While overall readings of any scene can be calculated by checking both highlight and shadow area and then averaging them out, the physical size and angle of view definitely make the 3/21 meter more of an essential unit for the man interested in obtaining proper exposure of a small element within a scene. The 3/21 can do this with ease.—H.K.